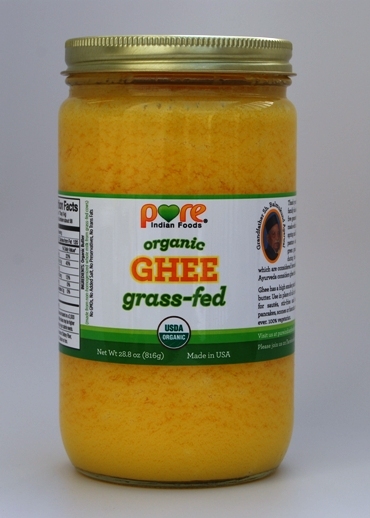 gorgeous and glorious GHEE… simpy golden and well.. wonderful! It is made from the HAPPY cows milk… and it is CASEIN free..
we can spread it on bread, we can saute with it, for it is very stable at high heats.. It is aromatic, and stores well on a shelf! I love love love ghee.. but CASEIN free??? PINCH ME! That leaves ME hunting for healthy oils.. Now .. YES I could “make it myself”… i know.. I KNOW… I went to school.. I KNOW how.. but really people.. I have a LOT happening, and making Ghee, just isn’t going to work right now.. We need someone to BUY this home, so WE can settle into our new home.. WHEREVER the Lord will lead us to live.. and THEN, perhaps, once settled again, we can DIY the GHEE thing..
Bee.. has a very helpful site, a wonderful resource, and I have often been blessed by her recipes.. So finding this gem on her site, thrilled me so much I decided I HAD to share it with you! Add popcorn kernals, cover and shake as needed so that the kernels do not stick but are evenly coated and constantly in motion… shake it baby SHAKE IT! Once it is all popped, drizzle the corn with GHEE, add sea salt, shake some more.. and do this in small amounts again and again, till it just tastes PERFECT! The only time Buddy gets ANY coconut is when we make popcorn (which is not NEARLY enough.. i hear ALL the time)… and only after about 10 months off of coconut.. he no longer reacts at all to it.. and we shall continue to introduce it slowly in this way to SEE how he responds..
Life is still.. BEAUTIFUL.. and YOU are loved! praising God for His creativity in creation.. for healthful options for His fallen, and broken, and weary.. Truly the LORD is great, and greatly to be praised…. This entry was posted in Uncategorized and tagged casein allergies, ghee, nourishing traditions, Weston Price. Bookmark the permalink.